After an inaugural season full of first time achievements, the Norton High School hockey team added their most significant achievement in just their second season of varsity competition: Qualifying for the MIAA State Tournament for the first time in program history. 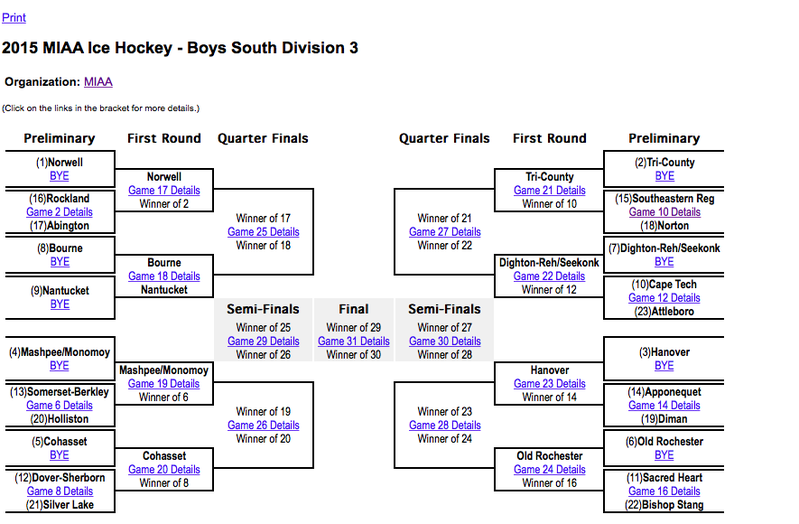 The Lancers finished the 2014-15 season with a record of 8-7-4 and were the 18th seed (out of 23 qualifying teams) in the MIAA Division 3 South Sectional bracket. Despite a first round loss in the playoffs, the team was extremely proud of accomplishing their preseason “20/20 Vision” goal of earning the 20 points necessary to qualify for the post season. In 2014-15, the Lancers offense was led by three forwards that achieved double digit point totals. The team’s leading scorer and MVP was junior forward Bobby Trudeau with 20 points (11 goals, 9 assists), followed by senior JFK Award recipient, Troy Parker at 13 points (7 goals, 6 assists) and sophomore Jake Palin with 12 points (4 goals, 8 assists). Trudeau and Parker also received Sun Chronicle All-Star Team selections with Palin receiving Honorable Mention. Key scoring contributions up front were also made by Lancers Rookie of the Year Brendan Heayden (5 goals, 3 assists), sophomore Jack Loranger (6 goals, 1 assist) and freshman Tony Cerce (3 goals, 1 assist). The defense was anchored by junior Matt Loranger (4 goals, 4 assists), sophomore Cam Trudeau (1 goal, 4 assists), freshmen Clint Gallagher (1 goal, 4 assists) and rookie John Giguere (4 assists). Gallagher and Cerce were the most versatile players on the team joining senior Cassandra Goyette and freshman Triton DosReis in a solid four player rotation at the goalie position which allowed an average of just 2.65 goals against per game. Goyette also received Honorable Mention from the Sun Chronicle and is now a goaltender for Nichols College.